sunglass hut — A. N. N.
Sunglasses Hut is the world's largest eyewear company and has always been synonymous with shades for all occasions. Their brief was simply to showcase 8 pairs of the latest season's shades in an engaging fashion film that was to be seeded out as a shoppable video on the ELLE Australia website. The shoppable element of presented challenges in that the video frames where the sunglasses were in the shot needed to hang slightly longer on the screen, which in turn loses momentum in the storytelling. To overcome the challenge of showcasing 8 varieties of sunglasses whilst also keeping the narrative moving we wrote a 3 part story where our protagonist was in three locations around iconic Bondi. These stories were then inter-weaved with each other, we wanted the viewer to wonder about our character. We wrote senarios where we could have the action happening around the protagonist so we could keep her in the centre of the frame long enough for the shoppable technology without the content feeling like it wasn't flowing. The result is a fun fashion film celebrating salty, sandy summer days, oh, and sunglasses. Behind the scenes filming in Bondi, Sydney. 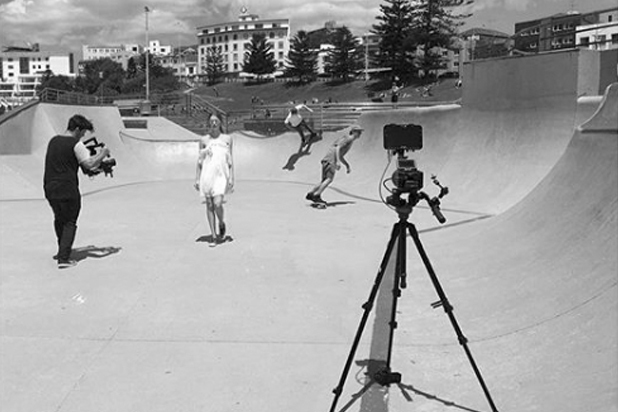 The film weavied together three storylines for the protagonist: reading on the beach, drinking juice at the skatepark and riding through the streets of Bondi. To keep the pace and the audience interested we moved back and forth between each scenario, allowing us also to fulfill the brief of maximising the pairs of sunglasses we featured. The styling was intentionally pieced together down to the custom bookcover we created that featured throughout the fashion film with a pair of Sunglass Hut sunglasses illustrated on the cover sleeve.